Jupiter steals the show this week as it reaches opposition, and its closest approach to the Earth since 1963. The giant planet reaches opposition – the point whereby the Earth passes directly between a planet and the Sun – on 21 September and resides amongst the stars of Pisces, culminating at 36 degrees. Observers will be treated to a disc a whopping 50 arcseconds across in apparent diameter and the gas giant will blaze away at mag. -2.9, a memorable sight indeed! Astronomy Now contributer Martin Mobberley captured this view of the giant planet on 2 September using a 300mm f/5.3 Newtonian at f/30. South is up. Image: Martin Mobberley. On opposition night observers will have to wait until at least 10pm before Jupiter climbs to a reasonable 25 degrees above the south-eastern horizon. There is then a six-hour observing window until 4am, plenty of time for all observers to get stuck into some serious imaging or sketching or just drinking in the views. 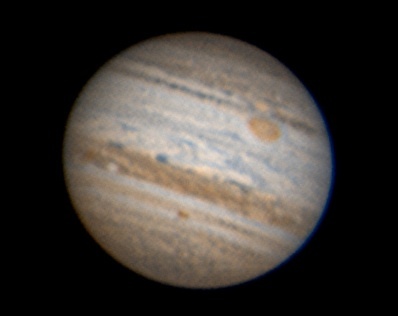 A 150mm reflector or 100mm refractor will show all the major dark belts and bright zones, along with the Great Red Spot and other major features present in the cloud tops at the time. Those lucky enough to have access to larger apertures may well be overwhelmed by the amount of detail visible through the eyepiece, especially in moments of good seeing. The planet may also appear brighter than 'normal' thanks to one of its brown belts – the South Equatorial Belt – having been hidden by a layer of bright white ammonia clouds for much of the year. Jupiter will remain bright, and near its closest point to the Earth of 368 million miles, throughout the latter half of September. 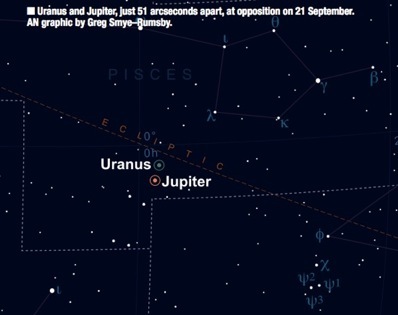 It's two for the price of one this week, as Uranus also reaches opposition on the same evening, lying 51 arcseconds north of Jupiter, but five times further away. If you have never seen the ice giant then now is a good time to use Jupiter as a celestial signpost. Any small telescope or binoculars should be able to distinguish Uranus' small, but unmistakeable blue-green disc, some 3.7 arcseconds across. For more information about observing Jupiter and Uranus at opposition, consult our online night sky guide for this week, and refer to Damian Peach's excellent article about observing and imaging the giant planet in the September issue of Astronomy Now, available as a back issue from the Astronomy Now Store.